Yes, it's the death of Buddy Holly, Ritchie Valens, and the Big Bopper, all in festive holiday colors. Please note that the plane has crashed into shredded Easter grass. Hmmm... somehow I managed to go from Easter to dead rock stars to biblical conspiracy theory to gay boyfriends. How does she do it, folks? Considering that it is a holy day, maybe I should offer a palate cleanser, no? Happy Easter to my peeps. And a blessed Passover, too. 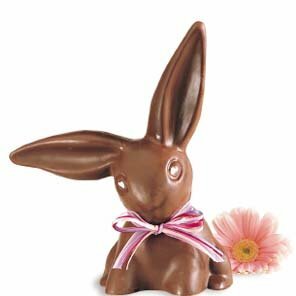 Remember - Cadbury eggs will be half price at CVS tomorrow. Sugar shock at work! Whoo-hoo! I've done a lot of things with Peeps and blogged about it. I even bought a package to sit on for a few weeks, while I figure out what to do with them. My favorite thing is to blow them up in the microwave. 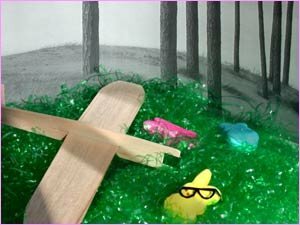 One day, I avow to tour the Peeps factory. I was about to defend the Dr. Who scarf (cuz hell, I wanted one when I was a kid), but then it sunk in: right, not so much the scarf, but the knitting... lol. About those Cadbury creme eggs going on sale tomorrow... I know of someone who cuts them in half, licks out the "creme", then quickly puts warm tea in the remaining chocolate cup and pops the result in her mouth. Chocolate tea; sounds kinda interesting! Holy crow, Beth! That is SO decadent!! I will have to tell the Sasquatch. He might want to give that a try. BTW, I *so* wish you could be here for one of the Dolby gigs - I'll be thinking of you. Just saw this: Power to the Peep-le. Check out the slide show of winning contest entries! I particularly like the conclave of Cardinals electing a new Peep. 4. If you really wanna be sick, the Tate/Lo Bianco murders.